The course covers the phonology and the fundamentals of Arabic syntax with conversational proficiency as the primary goal. Students learn to read and write the Arabic alphabet and gain proficiency reading and writing simple texts by learning tanvin, shadda, and sun and moon letters. Upon completion of this course, students can expect to be able to greet others. They will also become familiar with some cultural issues to enhance their comprehension. Grammatical topics cover definite and indefinite nouns, feminine and masculine, singular, dual and plural forms, yes/no questions, subject pronouns ( I and we), and adjectives. During this course, students will learn at least 100 vocabulary words. Students will also have an opportunity to develop their listening skills through different activities. (The teacher will supplement the textbook with various resources and handouts). Upon completion of level 2, students will be able to introduce themselves, make requests and describe things. Grammatical topics covered include verbal and nominal sentences, some WH (information) questions, demonstratives, some possessive and subjective pronouns, nisba adjectives, and past and present tense (conjugation for I and we). They should be able to name colors, seasons, numbers (1-10), some animals and objects. During this course, students will enhance their vocabulary by reading different simple texts and doing puzzles and games. They will have opportunities to listen to CDs about different topics. Students can also expect to be able to converse with more confidence and will learn about some cultural issues to enhance their comprehension. Upon completion of this course, students will be able to participate in basic conversations about a range of everyday activities. They will be able to read and write more complex sentences and they should be able to name some clothes, parts of the body, relatives, places and foods. Grammatical topics covered include adverbs, complete WH questions, complete conjugation of past, present and future tenses, making verbs in negation forms, some propositions, comparative and superlative adjectives, broken plural, and collective nouns. Conversational proficiency continues to be emphasized. Students at this level also begin to improve their reading skills by reading children stories and different texts. They will have the opportunity to listen to CDs about different topics. Students can also expect to be able to converse with more confidence and will learn about some cultural issues to enhance their comprehension. In this level, students will build a strong foundation by practice and review of all previous lessons. They will learn to predict the meaning of unfamiliar words based on their context and continue to improve their speaking and listening skills. Grammatical topics include: subject-verb agreement, direct and indirect objects, quantifiers, complete prepositions, and the imperative. They will have the opportunity to listen to CDs about different topics. Students can also expect to be able to converse with more confidence and will learn about some cultural issues to enhance their comprehension. Building upon the skills studied in level 4, students will be able to read and understand multi-paragraph texts. This course will help students apply all the grammatical rules that they have learned in the previous courses and they will practice and refine their skills through oral and written exercises. Grammatical topics covered include conditional sentences, imperative, patterns of verbs, etc. They will be able to comprehend some proverbs, idioms and slang and will learn about some cultural issues. Students will be able to understand some videos in Arabic and then actively discuss them. During this course, students will enhance their vocabulary by reading different texts and doing presentations, puzzles and games, among other activities. They will have the opportunity to listen to CDs about different topics. Students can also expect to be able to converse with more confidence and will learn about some cultural issues to enhance their comprehension. This program is designed for students who want to enhance their conversational abilities. It emphasizes practical speaking skills with discussion topics which will be based on the students’ needs, interests and proficiency. Moreover, topics are selected from a wide range of fields including daily life, health, literature, science, politics, culture, religion, etc. This course provides students with the opportunity to improve their speaking and listening skills considerably by listening to a variety of subjects and discussing them. They will be able to comprehend some proverbs, idioms and slang and will learn about some cultural issues. During this course, students enhance their vocabulary by reading different simple texts and doing presentations, and puzzles and games, among other activities. Grammatical lessons are integrated in response to students’ needs and objectives. There is an oral assessment test prior to the initial session to evaluate the student’s proficiency level as beginner, intermediate or advanced. (The teacher will provide various resources and handouts). This program is designed for students who want to enhance their writing. It emphasizes practical writing skills with practice writing in different topics which will be based on the students’ needs, interests and proficiency. During this program, they will remarkably improve their vocabulary, spelling, punctuation and comprehension by reading from a variety of resources. Students will be able to comprehend some proverbs, idioms and slang and will learn about some cultural issues. Grammatical lessons are integrated in response to students’ needs and objectives. 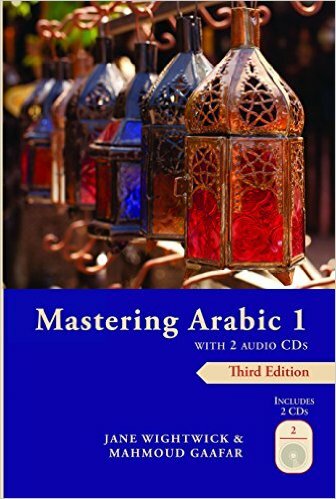 Over the past thirty years, we have reviewed many university-level Arabic textbooks and have selected Mastering Arabic, third edition (Hippocrene Press) as the one that best fulfill the objectives of our students in beginning and intermediate levels. Teachers provide suggestions for texts and supplementary materials at the higher levels. Books may be purchased at the Barnes and Noble Boston University Bookstore, 660 Beacon Street, Boston or on-line on Amazon.com. Tuition for the Arabic program at all levels is $419. There is a non-refundable $35 registration fee for first-time students only.